Chess fans and newcomers alike will enjoy checkmating friends with “Chessmaster Live” on Xbox LIVE Arcade this Wednesday, January 30 at 9:00 a.m. GMT (1:00 a.m. PST). A downloadable version of Ubisoft’s hit “Chessmaster” series, “Chessmaster Live” allows players to test and tune their chess skills against the AI or opponents of all aptitudes around the globe via Xbox LIVE. “Chessmaster Live” features five original chess variants, including a Message Chess option, which allows gamers to engage in matches over the span of several days, weeks or even months. The title boasts both beautifully crafted 3D chess sets inspired by luxury chess board designer House of Staunton. “Chessmaster Live” will be available worldwide (with the exception of Japan . 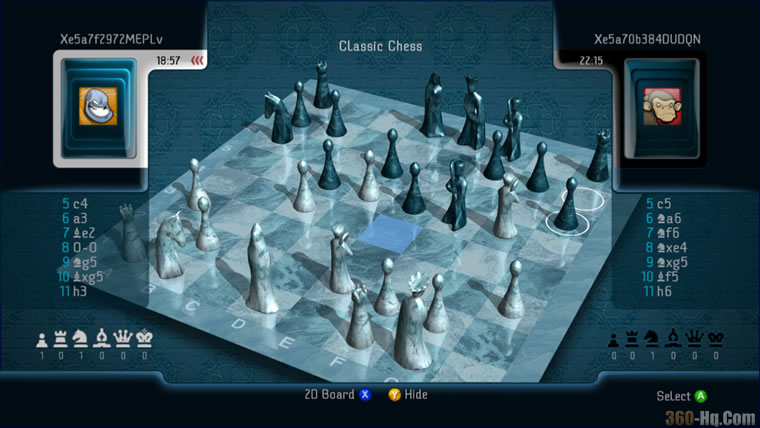 Enjoy playing as a real strategist with the Xbox LIVE® version of the most-acclaimed chess franchise. Chessmaster LIVE allows you to challenge friends and players all over the world in thrilling contests and determine who's the real champ. Choose among several 3-D (or 2-D) sets and play against virtual characters or real opponents over Xbox LIVE. Solve puzzles and discover exciting variations of this classic board game. Beginners can learn the basics of chess, and veteran players can improve their mastery of the game with the advanced scenario. The game is yours ... it's your move! Capture all your opponent's pieces in Classic Chess (Single Player). Win 1 game (Single Player) in less than 5 minutes (personal time). Win 1 game (Single Player). Defeat a chess personality with an ELO rating of 1000 or more. Win online against a higher ranked player. Experience the most gripping and famous battles of WWII through the eyes of a squadron commander and ace fighter pilot. From the battle for England, the attack on Pearl Harbor, to the bombing of Berlin, your pilot skills will create WWII history. Conquer the skies of Western Europe, North Africa, and the Pacific and bring your squadron bac..
Open Season is a riotous romp in the great outdoors, where the rowdy brood of forest animals turns the tables on a bunch of unsuspecting hunters. When a domesticated grizzly named Boog gets lured into leaving the creature comforts of home by a fast-talking mule deer named Elliot, he finds himself lost in the woods just three days before hunting sea.. Play Beowulf, an epic hero tormented by desire for power and glory. A slayer and a king – torn between the nobility and brutality within him. You are Beowulf, legendary Norse warrior with the strength of 30 men. Arrogant, self-serving, and lustful for gold and glory, you journey to Denmark to destroy a bloodthirsty beast wreaking havoc o..
King Kong: The game will be available worldwide on all platforms at the beginning of the holiday season in conjunction with the December 14, 2005 theatrical release of the movie. ..